Alfred Hitchcock’s Saboteur (1942) was another one of his inimitable sequential scenarios involving a perilous journey across a string of linked narratives. These kinds of stories were Hitchcock’s forte and represent some of his very best films, including The Man Who Knew Too Much (1934), The 39 Steps (1938), and North By Northwest (1959). In fact if you look at all four of these films, you will find a number of striking similarities in terms of cinematic storytelling technique. ultimately thwart their evil plans. Both films feature a tour through some of America’s most famous iconic monuments and tourist sites. In Saboteur it includes Hoover Dam, Rockefeller Center , the Radio City Music Hall, the Brooklyn Navy Yard, and the Statue of Liberty. 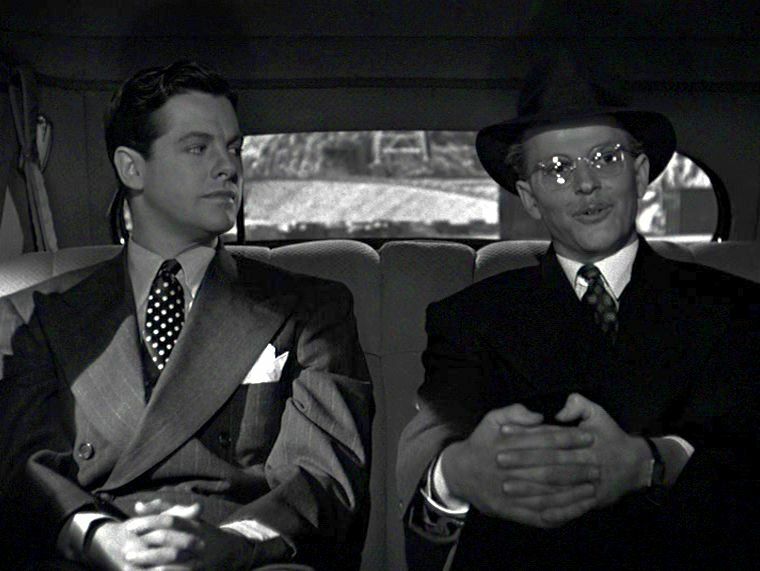 Both films feature an important male member of the predator/antagonist group who has uncertain sexuality – Leonard in North by Northwest and Mr. Freeman in Saboteur (and perhaps Fry, too). The questionable masculinity of sinister characters is a recurring theme in Hitchcock’s films. 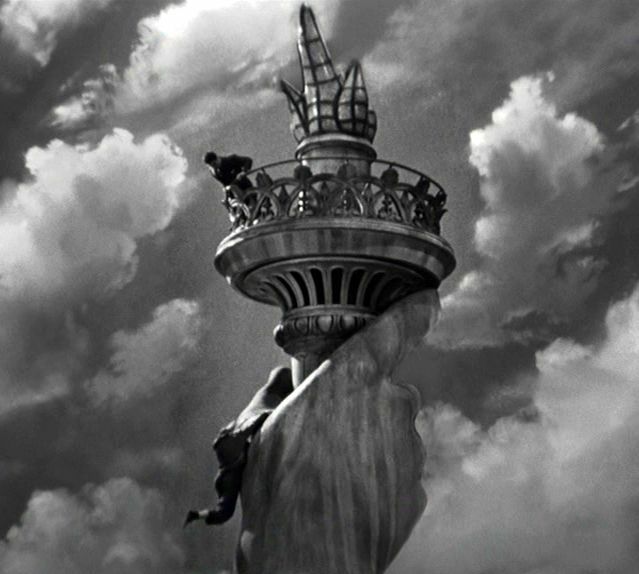 Both films feature breathtaking acrophobia-inducing climaxes atop tall monuments, where someone falls to his death. This is also a recurring Hitchcock theme and featured in Vertigo (1958) as well. 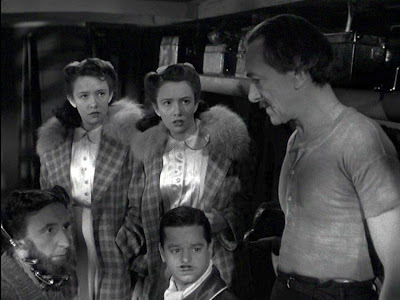 Hitchcock liked to cast big-name box-office stars as the leads in his films, and for Saboteur he wanted Gary Cooper and Barbara Stanwyck. But since he was relatively new to Hollywood (his first Hollywood feature, Rebecca was released in 1940), he didn’t have the financial clout for this, and wound up with Robert Cummings and Priscilla Lane in the leading roles. They serve him well here, though, and I think this is the best Cummings performance that I have seen. The scenario of Saboteur runs though nine separate sequences, each of which achieves a partial closure and leads to the next step in the protagonist’s journey. Barry Kane and his friend Mason work in a large military airplane factory in Glendale, California, a suburb of Los Angeles. One day at work they bump into an unfamiliar and unfriendly coworker, who drops some letters and money on the shop floor, which they pick up and hand back to him. Shortly thereafter a massive fire breaks out in the factory. 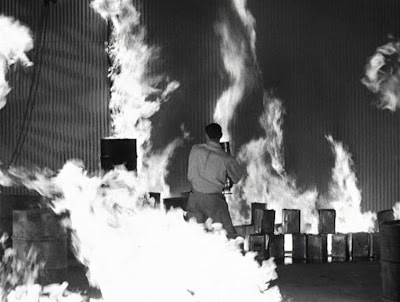 In the ensuing rush, the same unfriendly coworker hands Kane a fire extinguisher, who passes it onto Mason, who is quickly engulfed in flames and dies. The next day investigators inform Kane that the fire extinguisher was filled with gasoline, and Kane realizes that he is suspected of being the saboteur who started the fire. When Kane goes to console Mason’s mother at her home, the police come looking for him, and Kane slips out the back way and manages to hitch a ride on a truck. Outcome: Kane has momentarily avoided the police, but he must continue his escape and find the unfriendly coworker who handed him the fire extinguisher and who must be the real saboteur. On the truck out of town while Kane chats with the driver, he suddenly remembers what was written on one of the letters he handed back to the suspicious coworker. It was addressed to Frank Fry at Deep Springs Ranch, California. Outcome: Kane has escaped the police again, and he must go to this ranch in pursuit of Frank Fry. Kane gets to the ranch and meets the wealthy owner, Charles Tobin, who denies all knowledge of Frank Fry. 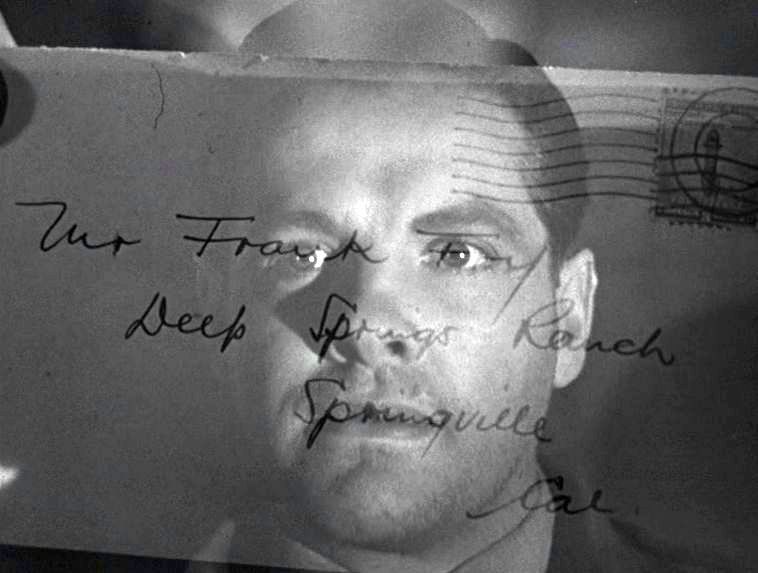 But Kane discovers another letter there that was addressed to Fry and also a telegram indicating that Fry should go to Soda City, California. Now Kane has made some progress on his quest. However, Tobin knows that Kane is a fugitive from justice and, after a scuffle, Kane is captured, handcuffed, and handed over to the police. Things look bad for Kane here, but the serendipity that often shows up in Hollywood movies intervenes. The police car taking Kane back to LA gets stopped on a bridge, due to a problem with the same truck that had earlier given Kane a ride. Kane seizes the opportunity to get out of the car, jump off the bridge, and swim to safety, while the friendly truck driver misdirects Kane’s pursuers so that he can get away into a forest. Outcome: Kane has gotten away from the police again, but he knows that there is an all-out manhunt for him, and he must now get out of his handcuffs. He now has to get to Soda City to find Fry. Kane makes his way to a cabin where a very cordial blind man lives and welcomes Kane to dinner. When the blind man’s daughter, Pat, show up, they discover that Kane is handcuffed, but the father assures Pat that he intuitively knows that Kane is a good man. He instructs her to take Kane to a local blacksmith in order to remove the handcuffs. Pat takes Kane away, but her intention is to turn him over to the police. However, on the road Kane proves to be quite resourceful. He commandeers the car, uses the car motor fan to break his handcuff chains (which wrecks the car engine), and kidnaps Pat on foot. Outcome: Kane has avoided the police, but he must now get to safety with the uncooperative Pat in tow. Kane sees a slow-moving caravan of trucks transporting a circus, and they manage to jump onto the last truck, which holds a collection of performers for a freak show, including a bearded lady, a fat lady, a midget, and Siamese twins. The circus caravan is stopped and searched by the highway police looking for Kane, but the circus freaks, wanting to stick up for people who are down and out like themselves, conceal Kane and Pat. Outcome: Kane has avoided the police again, and now he has managed to win over Pat to his cause. They head for Soda City. Soda City turns out to be an abandoned ghost town, but Kane and Pat discover a cabin that it is apparently a staging post for a sabotage operation to blow up the huge Hoover (Boulder) Dam. Two of the saboteurs, Neilson and Freeman, show up and question Kane just when Pat happens to be in another room. 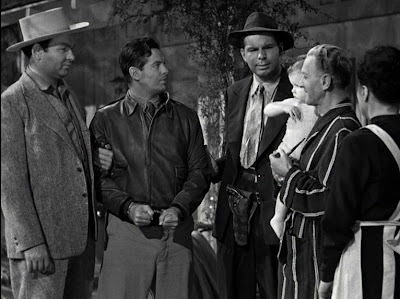 Kane manages to convince them that he is really part of their sabotage gang and that they should take him by car to their headquarters in New York. Evidently hearing and believing Kane's lies before she sneaks away, Pat changes her mind about Kane again and goes to a local sheriff to report his presumed perfidy. Outcome: Kane is headed for New York City in search of Fry, but Pat is now his enemy again. The scene now shifts from the West Coast to the East Coast. 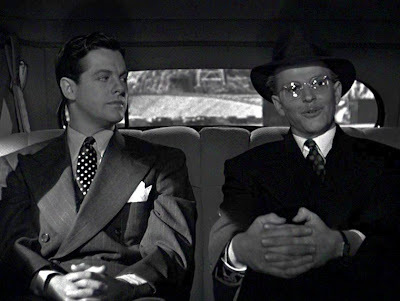 Freeman and Kane arrive in New York and go to a party at the mansion of a wealthy dowager and socialite who is apparently in league with the fascist saboteurs. In a room upstairs Kane is shocked to discover that Tobin and Pat are present. 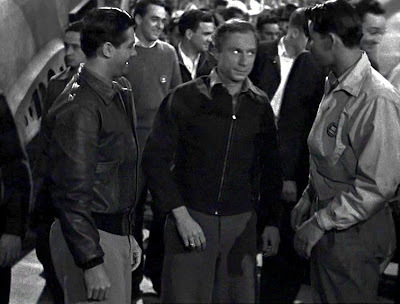 Tobin is evidently a key member of the saboteurs, and Pat was captured and taken to New York after ruining the saboteurs’ plans to blow up the Hoover Dam. Pat realizes now that Kane is on the level and that she is in love wit him, but they are both now captives: Kane is locked in the mansion’s basement, and Pat is locked in a room in the RCA (GE) Building. Outcome: Kane and Pat now know that the saboteurs intend to blow up a battleship about to be launched the next day at the Brooklyn Navy Yard. But they are both locked up and powerless to stop it. And Fry has still not been located. Kane and Pat both find ways to break out of their confinements, and Kane rushes to the Brooklyn Navy Yard, where he finally finds Fry in the act of attempting to blow up the big navy ship at its launching. 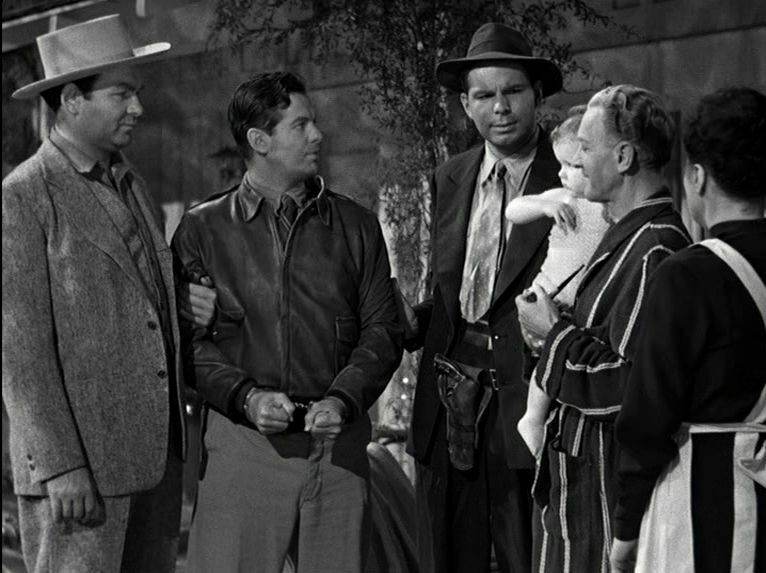 Kane wrestles with Fry to thwart that sabotage, but Fry pulls his gun and forcibly takes Kane back to the gang’s office at Rockefeller Center. Pat, however, had tipped off the cops, who are waiting at the gang office to arrest the rest of the saboteurs. Kane is immediately held in custody by the FBI (he is still wanted by the authorities), and Fry escapes into the Radio City Music Hall movie theater, where he shoots a spectator and escapes in the resulting pandemonium. As Fry is getting away into a taxi, Kane, still in custody, sees him and calls out to Pat to follow Fry on her own. Outcome: Fry has finally been found, and Pat must now track him. As Fry makes his way to southern Manhattan, he passes a half-sunken ship at a harbor dock and smiles, as if knowing that this was one of his gang’s acts of sabotage. In fact Hitchcock was showing footage of a real US Navy ship, the USS Lafayette, that had recently caught fire and capsized, perhaps due to a real act of sabotage. Fry goes to the Statue of Liberty (why he would go there is hard to fathom) to hide, but Pat follows him and lets the FBI know. Eventually Kane and the FBI arrive, with Kane chasing Fry up to the top of the statue’s torchlight lookout. Fry falls over the railing, and though Kane tries valiantly to save him, Fry eventually falls to his death. When Kane climbs back up to safety, Pat is waiting to embrace him. Outcome: With the sabotage gang captured, we can assume that Kane will be cleared of the charges against him. He and Pat are heroes. 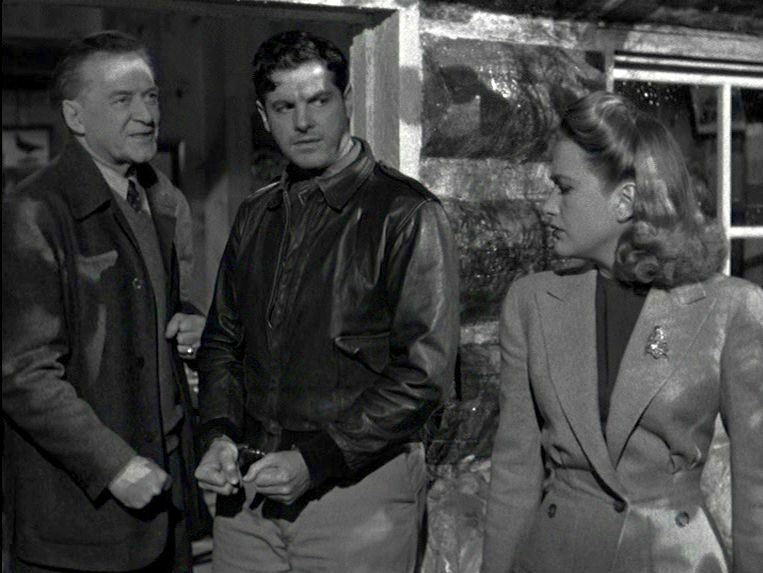 Although the plot of Saboteur is full of unexplained happenings and outlandish coincidences, the breakneck pace of the film shields these curious details from the viewer. Indeed the fact that the many studio shots employing back projection fit relatively seamlessly into the visual sequencing is proof to just how effective are the professional camera placements and editorial cutting. Note, however, that since the film was made during the darkest days of World War II, there is a considerable degree of patriotic propaganda laced throughout the film that sometimes brings the narrative pace to a standstill. Some of Barry Kane’s patriotic speeches were apparently written by Dorothy Parker, and they come across dramatically as very artificial – but I suppose that we should make accommodations for the stressful times of that period. 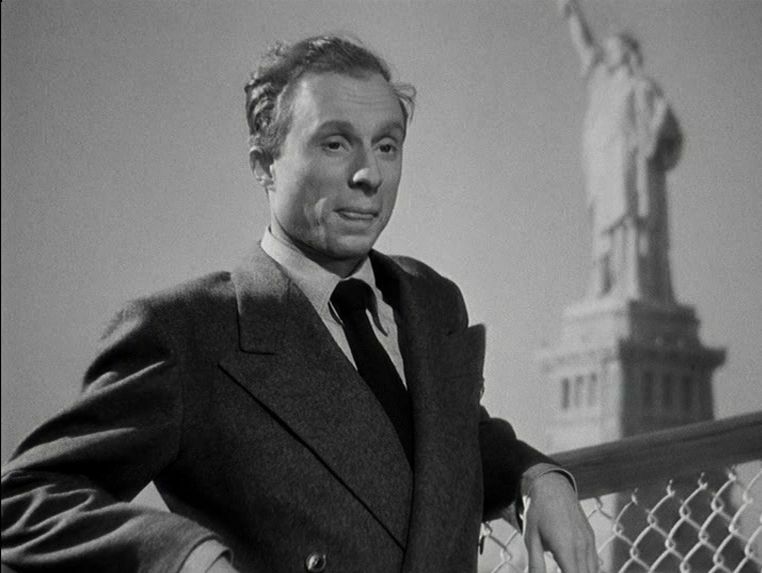 Another noticeable theme in the film is the sense of American solidarity with the common man. Kane is a known outlaw, but he is successively assisted by the friendly truck driver, the blind man in the cabin, and the circus sideshow performers, all of whom are innocently openhearted and keen to stick up for the underdog on the run. This, too, adds to the patriotic, “we’re all in this thing together”, flavor of the film. Another American value on display is Kane’s overriding sense of fair play and the obligation to live up to humanist principles. At the end of the film, Kane risks his own life in an effort to save Fry’s life, even though that man is a terrorist. I wonder just how pervasively that sense of fair play still holds in America today. Let’s hope it does. But beyond these issues and period-piece elements, Saboteur still stands as a fascinating general display of narrative film technique. This plot scheme is like life, itself – we find ourselves focused on local, immediate circumstances and demands, but we are also aware that there are longer-term goals on the horizon that only we know about. This is an impressive web. I found it by sheer luck after typing "47 ronin Kenji Mizoguchi" in google (I just watched the movie). What's the motive behind posting so much stuff about films? I have no idea and your web doesn't give a clue either. Anyway, you seem to be a kind of constant, conscientious and hard working person. I have always thought that it would be a good idea to create a kind of aggregator of good blog articles found online and yours are candidate number 1 (or 2 or 3... it doesn't matter the number) for such kind of publication. Would you let others to reproduce some of your articles in a magazine? Thanks. Yes, this work can be reproduced (I hope appropriately attributed) in magazines. Yes, you obviously will be mentioned. I will let you know if I finally do it.